If a lap/shoulder seat belt cannot be used properly, position the child in a booster seat in a rear seating position. 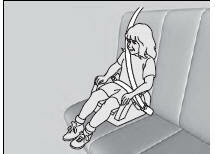 For the child's safety, check that the child meets the booster seat manufacturer's recommendations. When installing a booster seat, make sure to read the instructions that came with it, and install the seat accordingly. There are high- and low-type booster seats. Choose a booster seat that allows the child to wear the seat belt correctly. Some U.S. states and Canadian provinces and territories require children to use a booster seat until they reach a given age or weight (e.g. 6 years or 60 lbs). Be sure to check current laws in the state or province, or territory where you intend to drive.